1905 Butler Bros. Wholesale Catalog. KEYHOLE Exterior: Appears on the exterior of dome-footed bowls and plates in the Raindrops pattern. There is no Raindrops design on the interior of this bowl. The absence of that interior pattern is found only on marigold examples, and they are few and far between. 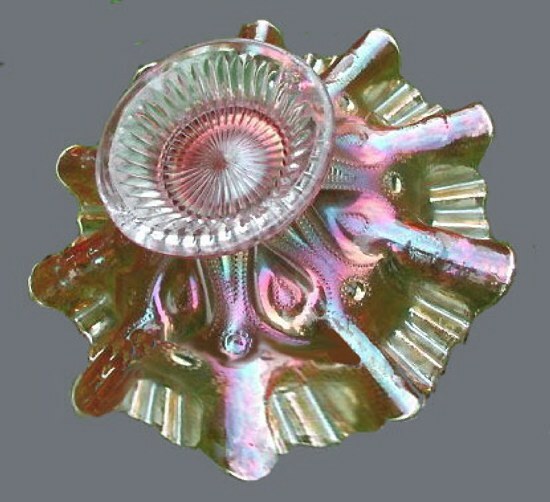 Prior to the carnival glass era, this pattern was used extensively in the production of non-iridized opalescent colors during the 1905-1906 time period. Peach opal, amethyst and oxblood are the basic colors for Raindrops examples found in banana shape, round shaped bowls having 10 edge “crimps” of various depth. There is a general opinion that only marigold (three-and-one edge) bowls are found having only the Keyhole exterior and NO interior pattern?? If anyone can counter that opinion, we would appreciate a photo of proof! 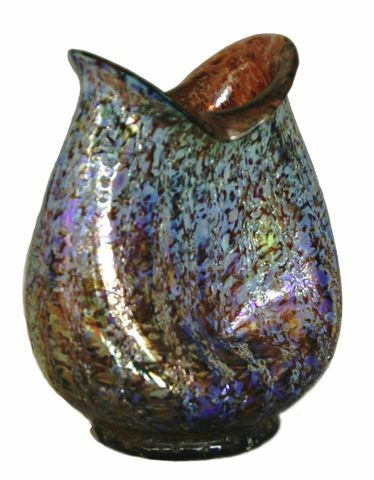 Left: - Venetian - Purple Pinched Vase - 6 1/8 in. tall x 5 in. wide. Right - 9.5 in. 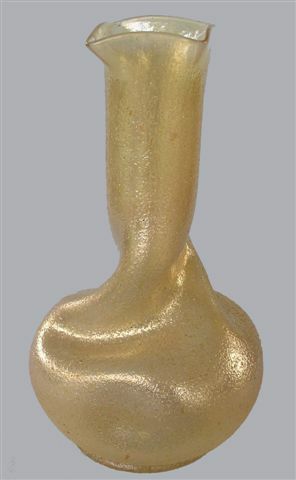 high - Circa 1904 Venetian Art Glass vase in Golden Yellow. VENETIAN Vases: As early as 1904, Dugan was producing mold blown, iridescent art glass lines called Venetian, Pompeian, and Japanese. Shaping derived from the Roman and Oriental eras, today are simply what we refer to as “modernistic” in appearance. Molten glass was gathered on the rod, rolled in “frit” (finely crushed glass). This became embedded in the molten glass. Hand shaping and “warmed in”, the frit oxidized, resulting in a silver/gold iridescence. This glassware extended into 1909, with various assortments appearing in wholesale catalogs. 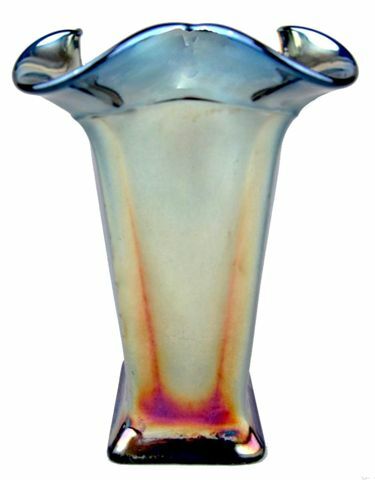 Fenton Glass Co. introduced the first iridescent glass to qualify as carnival during the fall and winter of 1907-1908. 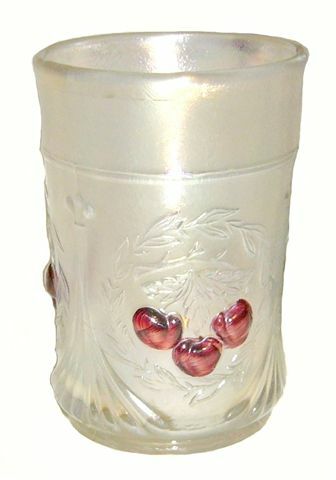 WREATHED CHERRY Tumbler: Water sets in this pattern are found without any red/gold trim, and occasionally with only gold trim, but it is somewhat unusual to see a piece with only red trim. This pattern was used on an oval berry set, table set, water set and toothpick holder and the famous Dugan oxblood color was produced, along with marigold, amethyst, and white, along with peach opalescent and cobalt blue found in the berry sets. The toothpick was made in amethyst ONLY! 1911-1912 was the prime production era. The 1912 Broadway Rouss catalog named the pattern “Cherry-land”. St. Clair reproduced the toothpick in the late ‘60s. primarily in blue. There is no trademark. Oxblood RAINDROPS - 8 in.- 9 in. Dome footed bowl. RAINDROPS: The Dugan African Iridescent line, or commonly called black amethyst or oxblood, was introduced in March, 1910. Certainly, Raindrops is found having that coloration. The Keyhole exterior design is a carry-over from the previous opalescent production. 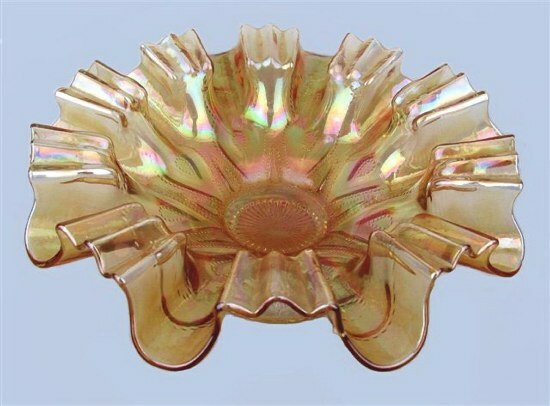 These bowls are usually 8”- 9” size and may be ruffled, tightly crimped, have the three and one edge or have the Dugan edge shaping of 10 flat, squared ruffles, with this edge treatment most often encountered. Banana shapes can be found, along with a deeply rounded type bowl having 10 rather tight “crimps” as an edge treatment. Peach opalescent and amethyst are other colors to look for. 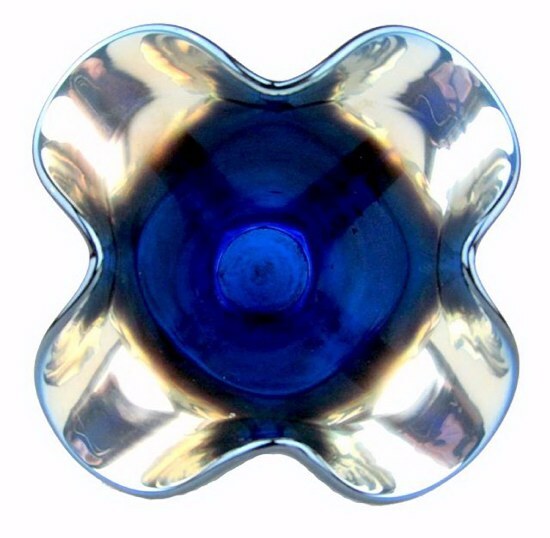 #501 ROYAL LUSTRE Vase - Cobalt. Top Opening - ROYAL LUSTRE Vase - Cobalt. likely from the mould used C. 1913 for the #501 vase. ROYAL LUSTRE Vases: Candlesticks, console bowls and vases comprise this line of glass which, according to Carl O. Burns, were attributed to Imperial Glass as their Imperial Jewels line. 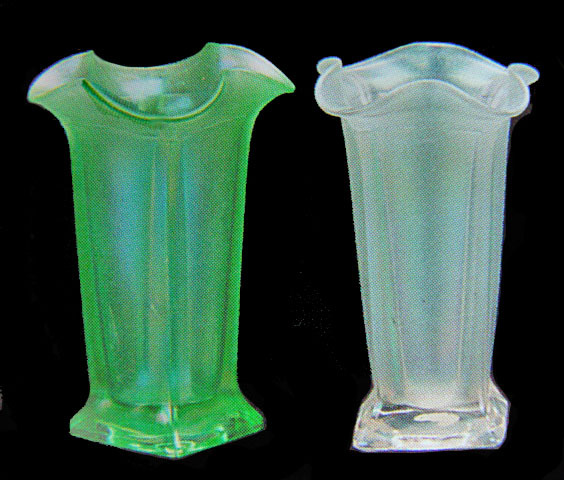 However, these have been determined as part of the Diamond Glass Co., Royal Lustre Line produced from 1924-1926. 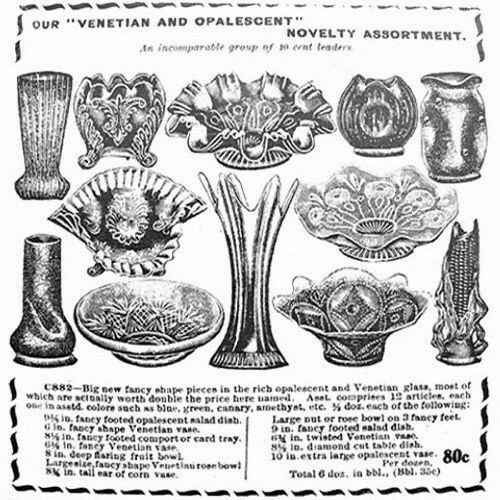 Prominently featured in a Diamond Glass Company ad in the Dec. 18, 1924 issue of Crockery and Glass Journal. Royal Lustre was the original trade name for the line. Diamond RAINBOW LUSTRE - Vaseline Glow! - 9.75 in. high. Diamond RAINBOW LUSTRE - Vaseline. 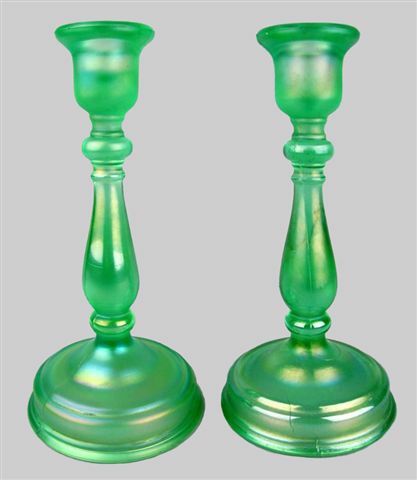 RAINBOW LUSTRE Candlesticks: Marigold, white, ice green, celeste blue and pink afterglow are listed colors but recently we discovered this pair with the Vaseline glow! This is one of Diamond’s mid-late 1920s iridescent lines. It measures 8 ¾” tall, having a base diameter of 4 ¼”. Similar to Imperial’s Premium design, and never named in carnival glass circles, the name Rainbow Lustre is a logical one, since that was the original name applied for marketing purposes! 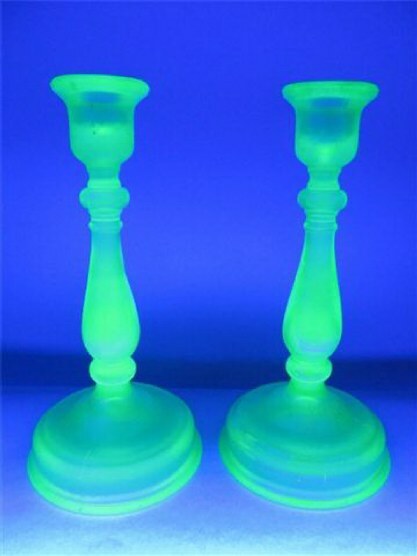 This, among other candlesticks might actually be better-termed “stretch glass”.